2015 has been an amazing year for the Search Engine Optimization industry. We witnessed the long-awaited Mobilegeddon update, which penalized sites falling behind in the mobile compliance area, a massive overhaul to local rankings with the new local three-pack, a new quality protocol for content, and a dozen or so additional small updates from Google. Now everyone is looking to 2016 for just what’s new! Let’s have a glance at the major 6 SEO trends expected to soar in the year to come. 1. Video Content Will Surpass Written Material in ROI for B2C Industries and Brands. Right now, written material is thought of the “standard,” even by the considerable bulk of us who continually insist that including various formats of content is a good idea. In 2016, a handful of new technologies and the continuance of years-long patterns will shift, and video will outmatchÂ written content in relations to reach, engagement, effectiveness, and overall ROI. Vine, Periscope, Snapchat, and various other video apps are somewhat behind this, setting users’ expectations toward more graphic content, but the real herald could emerge from Google, which is currently experimenting with video adverts in search results. B2C brands without regular feeds of video will soon be regarded as behind the times. B2B companies will do the same, but it won’t happen in 2016. 2. Mobile-Optimization Will Be Even more Vital than Desktop Optimization. For the last few years, desktop has been a traditional type of search, with mobile users increasing in numbers. Earlier this year, mobile searches went beyond desktop searches for the very first time, and together with Mobilegeddon, Google declared to the world that mobile and desktop web trafficÂ were on fairly identical footing. Beginning today, and continuing into 2016, this transformation will carry on, eventually making mobile web traffic by far the more vital, with desktop fading into obscurity during the next 5 years. Presently, Google is claiming that a desktop-specific site is not required, and their switch to a local three-pack demonstrates their commitment to a “mobile” experience across all sorts of devices. 3. Aggregated Information Will Decrease the Power of News and Event Coverage. Twitter is trying out a new function referred to as Moments, which will combine posts, pictures, and video clips from real-time events and unfolding news stories into a single channel for folks to see. In a sense, individuals become the content creators, and other individuals can view events unfolding firsthand. Obviously, Twitter isn’t the only system to be trying out such a live feed, and advanced algorithms are presently able to assemble news stories from numerous pieces of pre-existing information. As a result, in 2016, the strength of a news article that isn’t immediately sourced will start to decrease, narrowing the field of content marketing for everybody. 4. Social Content Will be More Conveniently Indexed. Google has offers in place with Facebook and Twitter already– search for a news item, and you’ll probably see a tweet or 2 appear in your mobile search results page. In 2016, even more platforms will come to be more heavily indexed in the vaults available to Google and various other search engines. Social articles will carry a value and a consideration similar to any independent website, and the separation of “web” and “social media” will begin to blur even further from an SEO standpoint. 5. Deep Links in Apps Will Become More Important. Google has been indexing apps for a long time now. As part of the shift to focusing on mobile users, Google is preparing for a future where apps might eclipse traditional websites in appeal and performance. Search marketers can benefit from anticipating this change as well. Starting in 2016, “deep links” to apps (meaning web links which aim towards a specified web page or section of a specified app) will start to bring more significance, akin to deep links on the web. App optimization in general, for that matter, will also grow in significance. If your medium-sized or larger business doesn’t yet possess an app, today’s the moment to develop one. If you still do not believe it works for your business, at the very least get your business listed on as many other apps as possible. 6. Local Search Will Get Even More Local. This is actually something we’ve watched flourish a little bit this year, but we believe the trend is definitely primed to take off in 2016. The onset of wearable devices, like the Apple Watch, and the improved elegance of Google’s local indexes are going to result in even more unique sorts of local search. Instead of identifying companies in relations to a city or a state region, rankings could rapidly produce accordinged to your street corner or neighborhood. 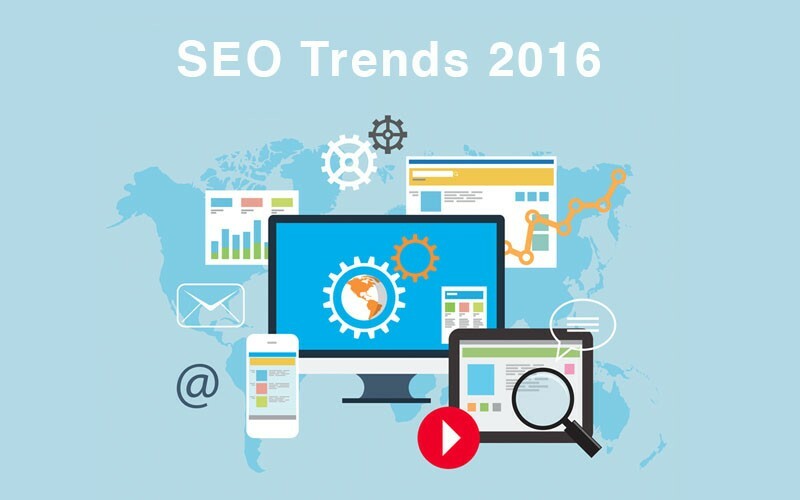 2016 may watch these trends develop in such a way that transforms the landscape of Search Engine Optimization, or it may only witness their introduction. Search Engine Optimization sometimes progresses counterintuitively, moving rapidly where you least expect it and dragging its feet where you ‘d anticipate it striking. Regardless, 2016 will definitely be a fascinating year for search marketers, and we are certainly looking forward to it at JHG Media Group! !